People might think we’re crazy for recommending an expensive $72 epilator. However, this epilator is actually worth every penny. The Emjoi AP-18 Emagine is one of the highest quality epilators available, as long as the person has plenty of money. For anyone who is wondering why it is so expensive, the Emagine is one of the only epilators with 72 tweezer heads to uproot the hair. This might sound painful, but the Emjoi is equipped with its patented Glide technology. The company’s website doesn’t exactly explain what Glide is, but it refers to the complex ergonomics of the device. This allows it to glide smoothly over the skin. The Glide technology really is as complicated as it sounds. Based on the video, the epilator integrates everything. It uses dual-opposed, rotating discs moving in opposite directions. The discs also have an unusual hexagon-edged shape that fits the shape of almost any skin surface. If that wasn’t enough, the intricate motion of the opening and clossing discs allow the epilator to gently uproot the hair and reduce the amount of pain. A bar in-between the heads, called the middle lifting finger, also helps to lift any flattened hairs. It reduces the amount of ingrown hairs caused by the uprooting process. The manufacturer claims that the device can remove hairs as thin as half a millimeter. Many consumers and web reviewers have praised the Emagine as one of the most powerful epilators. The ergonomic shape of the Emagine fits comfortably in anyone’s hands. The heads are curved nicely, so that they can reach any hard-to-reach areas of the skin. The device is also connected with a power cord, to guarantee that both discs evenly uproot hair from the skin’s surface. On top of that, the Emagine has two power settings. People can either use the low power setting for any fine hair or the high setting for coarse, thick hair. At times, though, the Emagine is almost too powerful. The device has a powerful motor that could miss some of the finest hairs on the body. The tweezers could also snap off brittle hairs, rather than pulling them out by the roots. With all that said though, the Emagine is very effective at uprooting hairs more painlessly than many other epilators. In fact, nearly every reviewer that the Emagine is one of the best epilators for removing armpit hair. 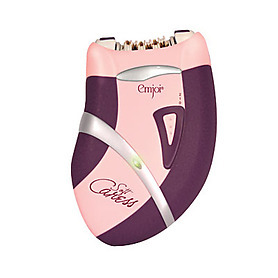 The curved contour of the head is very well suited to remove hair smoothly from the armpit area. The epilator could become bulky for people with smaller armpits, though. Despite a few flaws, the Emjoi Emagine is still one of the best epilators on the market. It certainly doesn’t come cheap, but it will definitely satisfy people who can afford it. It is available for the lowest price on amazon.com.